In part one, I went over the theory behind the self-balancing robot and in part two, I showed you my build using a modified toy truck. 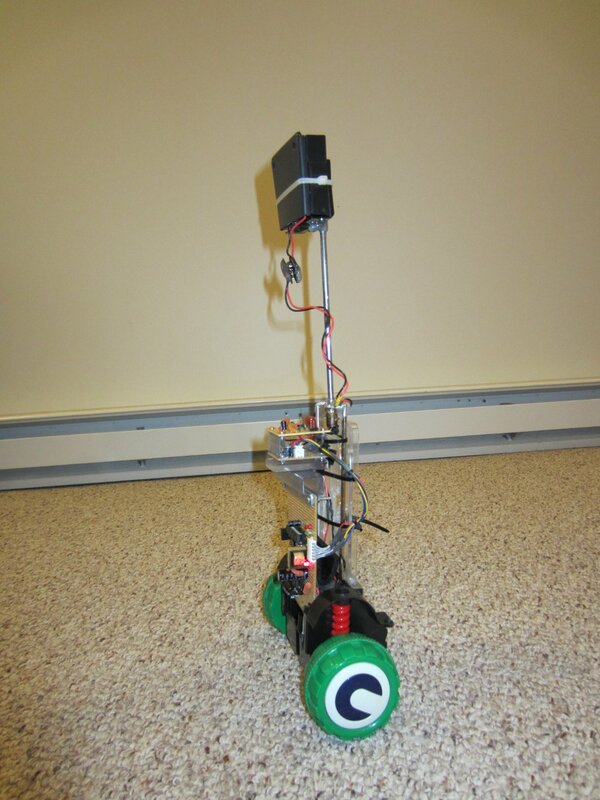 In this post, I will walk you through the code and show you the finished balancing robot. If you are impatient, you can scroll to the end for the demostration video and the source code. The code uses the Arduino framework and is built using the Netbeans IDE. For tutorials on how to develop Arduino applications using Netbeans, please take a look at my previous posting here. If you prefer the standard Arduino IDE, you may need to change the include statements to reflect your Arduino library path setup. The entire code listing can be downloaded here. Now let’s move on to the code. LPY450AL is an analog gyroscope and it is fairly easy to interface with the MCU using ATMega328’s analog inputs. Before performing any measurements, the gyroscope needs to be calibrated so we know where the zero point is (i.e. when there is no rotation). To do this, the following CalGyro routine is called right upon powering up within setup(). In order to ensure accuracy, the platform must be stationary as any movement will likely affect the zero position readings of the gyroscope. As you can see, the code basically reads and averages the axis’ outputs while the robot is stationary and thus the raw ADC voltage value obtained represents the gyroscope output value when there is no rotation. The readings are averaged over 25 iterations to minimize errors. An LED controlled via PIN_MODE_LED is used to indicate whether the robot is undergoing the calibration process. So it is important for the robot to be stationary when the mode LED is lit, otherwise the calibrated value would be inaccurate. The following routine reads the current angle measurement from the accelerometer. I discussed the code for MMA8453Q in one of my previous post. So if you wanted to learn a bit more about this accelerometer, you can take a look there. //Debugging code omitted here, see attached source for the full code listings. The elapsed time is calculated by measuring the time spent between two consecutive function calls to EstimateAngle(). Alternatively, you can use hardware timer interrupt in your code so that the time interval is precisely known beforehand. Because the readings from the gyroscope come from the ADC directly, they will need to be converted to the actual angles being measured. We could’ve just used the above formula as the final estimate for the inclination angle as the above calculation matches the filtering algorithm we discussed earlier. The control loop is relatively fast (e.g. 10ms per iteration). Since the time constants for the motors tend to be much longer, a 50ms control loop time interval is more than adequate. In this case, we could just add some delay or use a hardware timer to make the interval longer. But since the angular acceleration is not a constant during the measurement interval, we will loose some accuracy in the inclination angle calculation if the time interval is too long. The wheels of the toy truck I used are roughly 3 inches in diameter, which are pretty small compared to the size of the robot. The small wheel size makes it more sensitive to the surface conditions, which translates into larger variations in sensor readings. By averaging over several readings, we can decrease the sensor variations. That said, this last step may not be necessary in your case and you can simply set the ANGLE_BUFFER_LENGTH to 1 to bypass the buffer. The code for calculating the average is shown below. The variable angleBuffer is a circular buffer and the buffer values are updated within the main loop. Motors can be controlled via the classic PID control. Microchip’s application notes AN964 has some excellent explanation on the physics and math behind the PID control, and the notions in my implementation mirrors those in the application notes. The current inclination angle is estimated and stored in the circular buffer. The averaged inclination angle measurement is fed into the PID controller. As mentioned earlier, if no averaging is needed, the current inclination estimate can be used directly by setting the buffer length to 1. Parameters of the PID controller is calculated using the current error measurement (curErr) and the cumulative error (SumErr). We use the output of the PID controller (Cn) as the “throttle” to control the motors. The sign of the Cn corresponds to the motor rotation direction. If the inclination angle is too large (e.g. greater than roughly 40 degree), there is no way for the robot to correct its position anyway so we will simply stop the motor. This condition is needed to prevent the wheels from moving when the robot is positioned horizontally. The current error term is assigned to prevErr and now we are ready for the next loop. Now it’s time to power on the robot. Don’t expect it will work the very first time even if you did the programming correctly since there are many parameters involved in the whole process. Here are a few simple steps that you could use to ensure that the robot is functioning correctly and making parameter adjustments so that it could balance. Set the mode switch so that the motor is turned off and the debug information can be viewed via a serial console. Power up the robot and lie it flat, the angle reported from the accelerometer should be close to ±1 depending on which side is facing up (if you are using sine instead of approximating it the value read should be close to ±Pi/2) and the gyroscope reading should be around 0 since the robot is stationary. Hold the robot up straight to its balanced position, the accelerometer angle reading should be close to 0 and the gyroscope reading should remain around 0 when there is no movement. Pay attention to the angle reading when the robot is balanced, it may be slightly off zero due to the actual weight distribution of the robot. And if this value is none-zero, you will need to set the INIT_ANGLE to the observed value when the robot is in-balance so that this offset value can be subtracted from the actual measurements. Now try move the robot back and forth about its balanced position, you should see both the accelerometer and the gyroscope readings oscillate around 0. Pay special attention to the sign of the gyroscope readings. 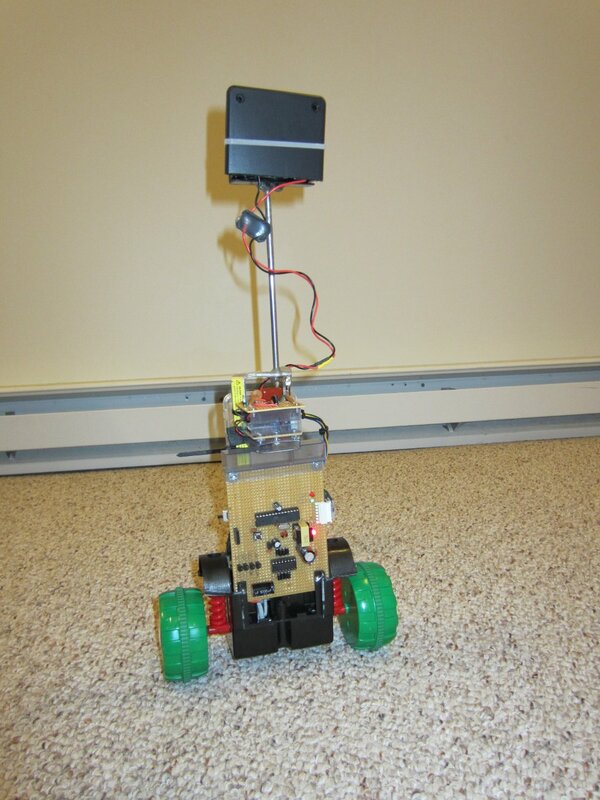 It should match the sign of the accelerometer reading when the the robot is moving away from its balanced position. Now set the mode switch to normal operation mode. Upon powering up, hold the robot in the air and move it gently around its balanced position. You should see the wheels move towards the direction of the inclination. And the motor should spin faster when the inclination angle is larger. Set I and D term to 0, and adjust P so that the robot starts to oscillate (move back and forth) about the balance position. P should be large enough for the robot to move but not too large otherwise the movement would not be smooth. With P set, increase I so that the robot accelerates faster when off balance. With P and I properly tuned, the robot should be able to self-balance for at least a few seconds. Finally, increase D so that the robot would move about its balanced position more gentle, and there shouldn’t be any significant overshoots. There are also a couple of constants in the I and D term calculations, they will need to be adjusted by experiments to determine the optimal values. If you are unable to balance the robot with the PID parameter adjustments mentioned above, chances are that the accelerometer or the gyroscope values are not calculated correctly and you will need to go back to the basic calibration steps mentioned earlier and see whether the readings from gyroscope and the accelerometer are handled properly. One common mistake is the gyroscope angle calculation, you will need to use the correct sensitivity according to the datasheet of the particular gyroscope you are using along with the formula we discussed earlier to come up with the correct angle. The choice of the values of a and b in equation (4) affects the time constants of the control and can be fine tuned with the control loop interval and ANGLE_BUFFER_LENGTH parameter to achieve the best result. In my case the weight I used is 0.95 for the gyroscope readings and 0.05 for the accelerometer readings. The ANGLE_BUFFER_LENGTH setting and the value for b affect the time constant (or low pass filter cutoff frequency) in opposite manner. When you increase the buffer length, the time constant becomes higher (cutoff frequency is lower). But when b is incremented, the accelerometer’s time constant actually becomes lower (cutoff frequency is higher). And the following is a short video of the balancing robot in action. The stability of the robot can be dramatically improved if you use a properly designed gearbox that has negligible gear backlash. The backlash in a typical toy gearbox is usually quite significant. In my case, the wheels can be turned by a few degrees in either direction before the gears are engaged, and this makes it harder to control the robot accurately. Also as mentioned earlier, larger wheels can also improve stability as the robot will be less affected by the surface condition. I have read up on this blog and the notes that you have referenced about the correct way to tune the controller but I am still failing to achieve balance and I am confident that the sensors were correctly calibrated with the correct values for their sensitivity etc. Is there any easier approach to achieving the correct values for the P I and D values than simply changing them slightly and reloading the code..? What you could do is use a few potential meters on analog pins and use the voltage readings to adjust the P, I, D values. This way, you could do it on-the-fly without having to recompile and reload the code each time. Thanks for the advice! Yeah I was thinking along them lines as well. I don’t if you are aware of the original thread started on the arduino forum for the balancing robot for dummies by Kas..? Any thoughts or comments on this alternative approach? Unless your timing is controlled via an interrupt, I wouldn’t use this method (via Serial console) to change the P/I/D settings. The reason is that the Arduino Serial library adds significant delays to the loop which may skew your tuning results. But it could work well if the effect of the added delay is accounted for. The code you included basically just reads from the serial console and if you press the “+” or “-” keys the corresponding value of Kp/Ki/Kd will change accordingly. I’ve wanted to build a balancing robot for a while as a way to jump into learning electronics but I could never justify the cost of the pre-made sensors. I just read through all three parts you posted and ordered everything to build my own. I ended up getting the MMA8450QT instead. I was already placing a big order from a supplier and that’s all they had. It looks like it runs at a lower voltage so I think it should still work but will give less resolution in the angle measurement? Thanks for the great write up! Since MMA8450QT works below 1.8 V, you will need to use a comparable voltage reference attached to the Vref pin of the ATmega328 in order not to lose resolution. The ATMega has an internal 2.56V reference voltage that could be used to give a pretty good range with a 1.8V sensor. In Arduino this would be analogReference(INTERNAL2V56). Be careful that you don’t have 5V connected to the Vref pin at the time or I think it might short your 5V to the 2V56 ref voltage. You would get 70% of the full resolution that way without needing extra parts. Excellent tutorial! For anyone interested I have several articles regarding sensor fusion on my blog http://www.starlino.com/ see under “IMU Theory and Experiments”. Great project – I must have a go some time. the same project that our professor wants us to make. can you help me with that? please email me.. thank you very much guys for the help! Which IDE are you using? The I2C library used is not the default one supplied with the Arduino IDE, did you download the I2C library? i downloaded the I2C.h and put it to the right place, If I’d remove it, there would be a lot more error. I tried the code in Arduino 1.0.1 and indeed had the same issue as you reported. It appears that for whatever reason the environment does not recognize the enum WheelDirection defined earlier. This could be a defect of the Arduino 1.0.1 environment as in NetBeans and Eclipse, this code compiled with no problems. I have created a modified version of the code that does just this and I had verified it compiles using Arduino 1.0.1. Thx for the code, now I can compile it, but doesn’t work. I have tested the robot with a simple motor driver (move forward, move back, etc..), so the building is correct. I think there is still something wrong with the code. Have you tested it on your robot? the throttle has a scaling factor there, which is typically applied experimentally. I would recommend tuning the scaling factor in the calculations for Cn/derivative term/integral term and see if you get the desired value ranges. Your goal is to set this value so that it’s absolute maximum value (e.g. when tilting the robot forward or backward) is around the maximum PWM resolution (255). And as I said, I tested the motor with a simple code, so the driver and everything seems good. Hmm… this is a bit puzzling as the throttle output is directly used to drive the motor via PWM output. So if the drive circuit is working properly (which I am sure it is as you indicated), you should see the wheels move. Do you have an oscilloscope at hand? If so could you see if the PWM pins have any activities when the robot is tilted? If not the only suggestion I have is to try a different chip since the PWM output should work. I think since I am using a different sensor, the measurements are in different scales. Would you be able to share your readings for when the robot is upright? What is the range for the currAngle? Is it between 0 and 1? and also the degX range? The accelerometer readings are dependent on the resolution. it should be within [-2^(n-1), 2^(n-1)), where n is the bit of resolution. So for a 10 bit accelerometer, the x reading is between -512 and 511. And the angles in the code is always between [-pi/2, pi/2]. In my code the angle is limited to [-0.7, 0.7] (roughly 40 degrees) so that when the robot does fall the motor can be stopped to prevent damage. The gyroscope reading is specified in the datasheet and usually is degree/second. So if the sampling period is 10ms and the reading is 5 for example, it should be interpreted as 500 degree per second or roughly 2.78.
hi, had a long break on this project. Tried several code examples and haven’t hit the jackpot yet. Actually just got it out last week for another attempt. Got myself some potentiometers for adjusting the pids. Also got a serial bluetooth so I hopefully can program it from my tablet using arduino comander. I am just trying to do the same thing with the MPU6050. I have some errors returned within the Arduino 1.0.1. If you have this sorted out could you share the code you have? Hate to do something twice, when it may have already been done elsewhere. I downloaded your code (main.ino) following your discussion with Antonio above because I’m using Arduino 1.0.1. I checked if the file exists and it does. I’m a bit new to arduino and a little bit lost in this, can you help? Try start a new sketch, copy and paste the code into the new sketch from main.ino and compile, it should compile without any errors. There is some issue with how Arduino IDE interprets the file name and unfortunately, main.ino confused it. If you rename the file to anything other than main.ino it should work. (I was not compiling it using Arduino’s IDE and thus didn’t encounter this behavior). Thank you very much, you’re correct, renaming it to kerry.ino solves the problem and it compiles without errors. Since I know now that it compiles correctly and since I only have an IMU with BMA180 and ITG3200 with I2C interface I will try to modify your code to fit this. I can read values from these devices and my only concern would be the difference in specs between your sensors and mine. Shouldn’t elapsedTimeSec (Ts) be in the denominator? Did you intend to remove the Serial.println (Cn) line? I find that the print statements add appreciable delay. If you take a look at the calculations in AN964 (Eq. 6 through 9), you can derive the equation used here. I just took a look, Ts should be on the numerator as shown. Regarding your second question, yes I wrote out Cn during testing and that line should have been commented out. Can you briefly explain the meaning of this two statements? else if (derivativeTerm < -120) derivativeTerm = -120;"
This is to limit the term to ensure that it remains within bound. Also, when I tilt the robot, both “accAngle” and “gyroAngle” should either increase or decrease together but not “one goes up and the other goes down”, is that that correct? There is no need to calculate the inclination angle. The inclination angular velocity reading from the gyro can go directly into a digital filter. The digital filter output goes directly to the motors. Simple and neat. The angle never needs to be calculated. There is no need for an accelerometer. I believe the accelerometer you are using in your design simply gives you positive feedback. Positive feedback is usually best avoided but in this case it stabilizes the loop. Some designs use encoder readings from the wheels to do the same thing. A much simpler solution is simply to produce the positive feedback within the digital filter. Simple and neat. There is no need for a Kalman filter. The robot cannot respond to the high frequency noise and the loop cancels the low frequency noise. Theory is on my website. You don’t need elaborate control theory. You just need math software to solve the system of differential equations. I ran into a problem when trying to adjust my PID. Both acceleration and gyro angle are working fine, include INIT_ANGLE. However for some reason, my Cn output is always negative. When I tilt the sensors, Cn will go up or down according to the direction of tilting, but always stay in negative region. For my understanding of the code, shouldn’t the Cn being “centered” at zero, and goes positive for one direction and negative for the other? Please help me point out where I might need to further adjust. Thanks for the amazing documentary, it really helped me getting into using IMU. I am trying to build a self balancing robot for my final year project. I have just started. I need some help in selection of motors. I would really appreciate if you could help me with the specification of motors and how to decide those specifications. I am in the 2nd step of buidling a 2 wheeled robot using an IMU6050. See below link for details… any help and comments are appreciated. I was looking at the your code, did the motors respond at low values of pwm? My bot’s motors require atleast offset value of 35 before it starts. Yeah, this would depend on the motor you use. If I remember correctly, mine could start at values around 10.
thanks a lot.. your awesome code make me happy..
hi kerry! Thanks for taking a time for sharing your balancing code! I applied your code for my peripherals. I used Arduino UNO and MPU-9150. So I tested code for this. Is it a right result? for this case, I just kept MPU-9150 stay on my desk. Hmm… doesn’t look quite right. If the sensor did not move, the gyroscope anagle should be near 0 and the calculated angle average should be near constant. but It doesn’t get right values.. i don’t know why..
not declared .. and not clear. can you please explain ? why did you write INIT_ANGLE as -0.005 ? and how can i find it ? I’m building one as a school project, though i have a problem with tuning the PID. When you say “oscillating”, what do you actually mean? Should the robot be oscillating while balancing on its own? Or while i’m holding it? I can’t really wrap my head around that. I’ve read a lot of blogs, articles, sites, they all say “tune kP til you get oscillation, then add kI to make it react faster to change”, but i don’t understand how it is supposed to oscillate, as in, should it be self balanced oscillation? Or me holding it? “Oscillating” means that the robot moves about its vertical axis. The best way to imagine this is that suppose it is in equilibrium, and if you push the top forward a little (in other words, it starts to fall forward) you will see that the wheels move forward accordingly and if you move the top backward, the wheels will move backward to maintain balance. In practice, since you can’t place the robot at its exact balancing point, the movement will be a slight back and forth (while you are holding the top, that is), basically, the robot will over-correct a little bit and go back and forth ever so slightly.